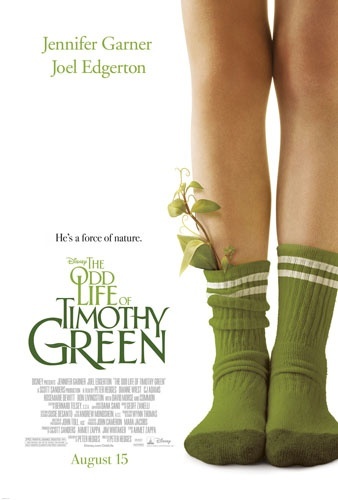 When I was in New York earlier this month I had the opportunity to see an early screening of the new film from Walt Disney Pictures, The Odd Life of Timothy Green. If you watch any television, you have probably seen the commercials. When I told my friends I was going to see this movie, the universal response was, "oh, that's the one where the kid comes up out of the ground." Kids coming up out of the ground sounds like some sort of weird zombie movie, and while moments of The Odd Life of Timothy Green are certainly a little weird, I can assure you there were no zombies. Cindy (Jennifer Garner) and Jim Green (Joel Edgerton) are anxious to be parents. They have an idea of what their family is going to look like and when life throws them a curve ball, they have to learn to adapt. Quickly. Timothy Green (CJ Adams) teaches them about parenting, tough choices, and deep, abiding love. I loved this movie. I laughed and cried my way through it. I hate to tell you too much because I want you to go see it! It's definitely a family film, nothing objectionable in it. I do think younger children might be bored, just because some of the movie will fly right over their heads. The major point I walked away with is that sometimes things are going to happen that are weird, wonderful and terrible. Sometimes those things, those wonderful, terrible things have a way of preparing you for something even more wonderful in your life. I know some children are already back in school so I thought I would share this clip of Timothy's first day at school.